Fall in love with the lights of the modern city of Dallas at night. The night tour takes you to the streets of downtown Dallas in the evening, passing by Main Street, Deep Ellum and much more. Fall in love with the lights of the modern city of Dallas at night. 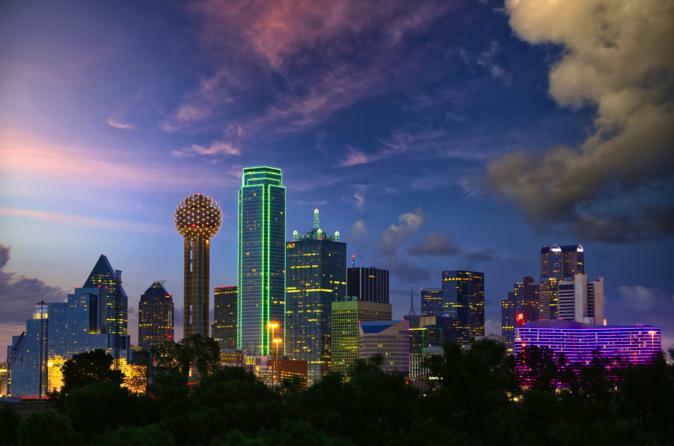 The night tour takes you to the streets of downtown Dallas in the evening, passing by Main Street and Deep Ellum, seeing the buildings that have their own lighting during the night such as the Bank of America Tower, Reunion Tower or the Hotel Lorenzo. Take a picture outside the Omni hotel with its spectacular lighting, discover the sculpture "The Eye" on Main Street, or take a selfie with the iconic Dallas Pegasus. At the end of the tour, you will have the option to return to the hotel or enjoy the nightlife in the neighborhood of your choice ** only Drop-off. Participating neighborhoods: Deep Ellum, Main Street, Uptown, and much more.